Adventureland. Dir. Greg Mottola. Perf. Jesse Eisenberg, Kristen Stewart, Ryan Reynolds. Miramax, 2009. Film. I wanted to watch this movie because of the cast. I fell in love with Jesse Eisenburg when I saw him in Now You See Me 2. The Now You See Me films are some of my favorites to recently be released. I also will admit to loving Kristen Stewart. Something this 100 movies project is going to reveal about me is my inner teenage girl and nerd girl tendencies. I'm not going to be embarrassed by this though and, in fact, I feel like the pop culture teenage girls like has a deeper level of quality and worth than it gets credit for (which is a blog post for another day). Anyway, I feel in love with Kristen Stewart when I saw her in Into the Wild and have been following her work since then. I'm also a big fan of Kristin Wiig. 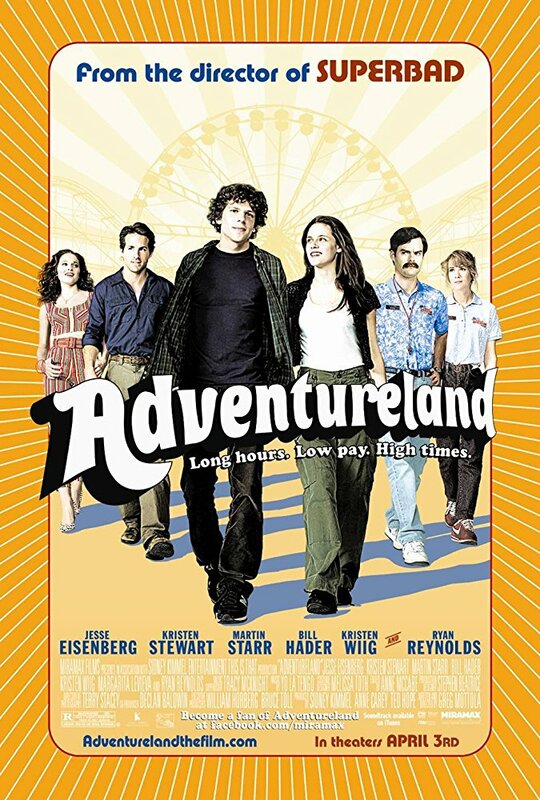 Adventureland is about an ivy league college student who has to find a summer job. He gets a part time job as a game manager at the local amusement park called Adventureland. This is set in Pittsburgh but I love it because there is also an Adventureland in my home state of Iowa. Anyway, the employees at Adventureland bond over pot, parties, and musings about the meaning of life. my boyfriend calls these kinds of films "slice of life" movies because it just shows a glimpse into a person's life. It could continue on forever and the plot is character driven rather story driven. I thought the characters where quirky and fun and there were some moments of real humor that made me laugh out loud. I'm a tough crowd when it comes to comedy so any film that gets me actually laughing is pretty brilliant. I would gladly watch this film again.